For those who like hiking, an excellent watch is a must. When you’re out in the wilderness with no roads or street signs to guide you, having something on your wrist that can provide you with not only the time but also other crucial information is essential. From GPS tracking and sunrise/sunset times to information about altitude and air pressure, hiking watches can offer many unbeatable features for explorers. Assisting with planning, navigation, and weather prediction, these best hiking watches are sure to make your time spent in nature more enjoyable, easier and safer. 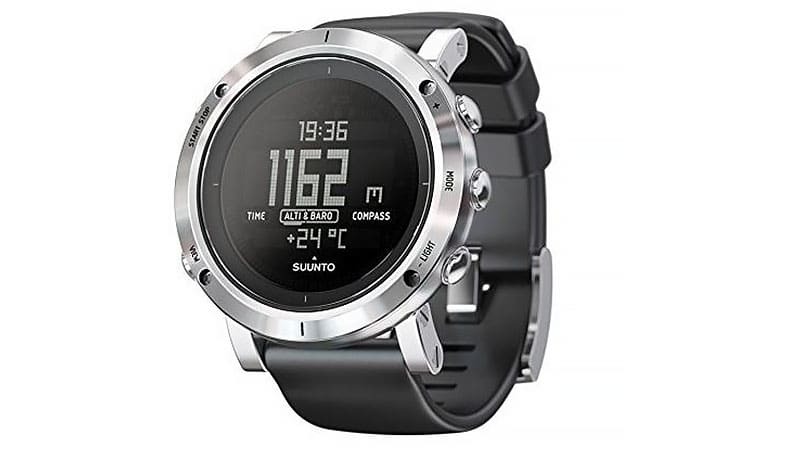 The Suunto Core is an award-winning watch and a reliable companion to many hikers. This multi-function timepiece and gadget offers its wearer many easy-to-use outdoor features in a sleek and stylish package. 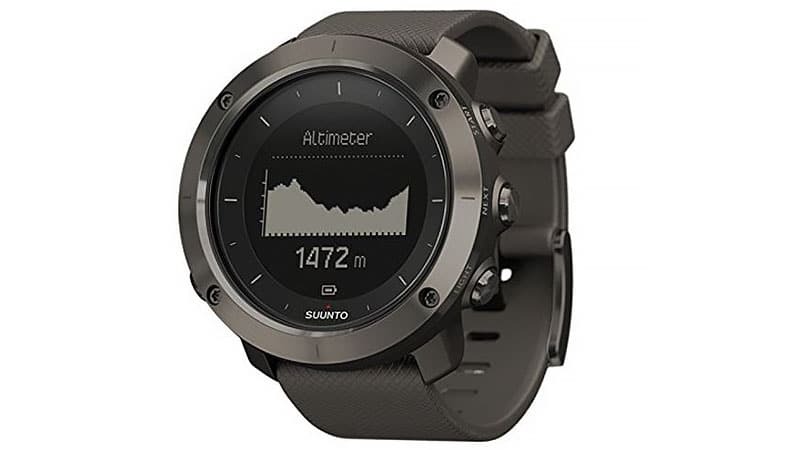 Featuring an altimeter, barometer and compass, the Suunto Core will track your vertical movement, provide information about the air pressure and help you find your way. A weather graph, storm alarm and preset sunrise/sunset times for over 400 locations also help this hard-working watch keep you safe in unfamiliar surroundings. 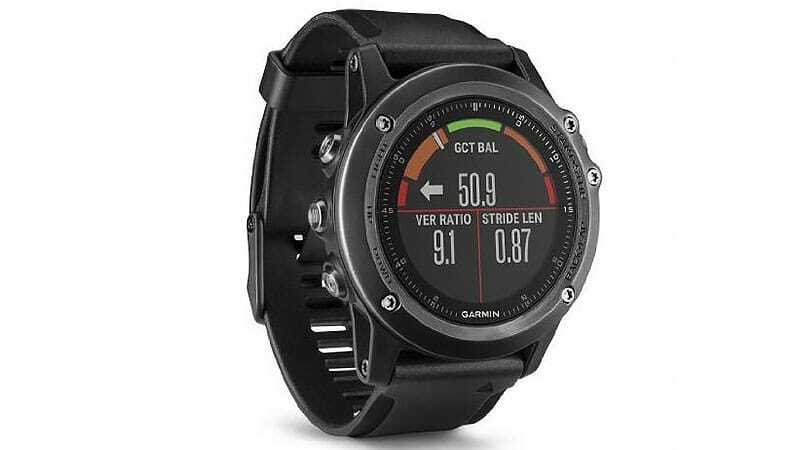 Performance meets style in the impressive Garmin Fenix 3 HR. Perfect for hikers and trail runners, this excellent timepiece will help you navigate the great outdoors while tracking your exercise. Equipped with an altimeter, barometer, and compass, the Garmin Fenix 3 HR provides useful real-time information to explorers. Also included in this top piece of wearable technology is a GPS, meaning that you can track where you travel and mark locations on your course. 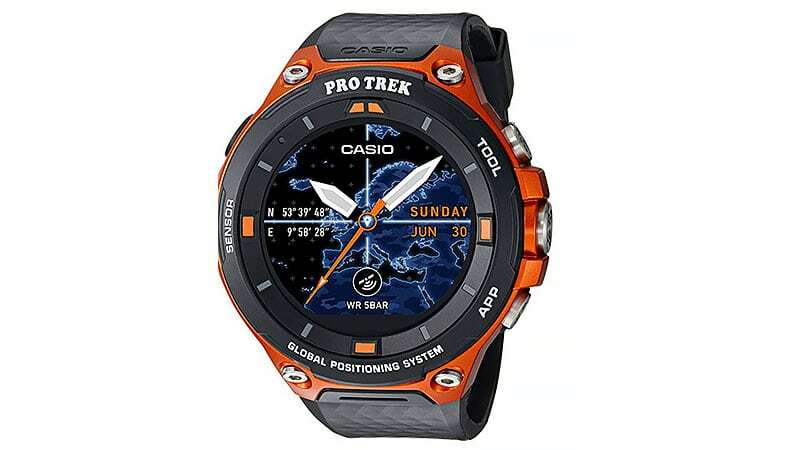 Casio’s other top hiking watch is the WSD-F20 Protrek. Unlike many other outdoor timepieces, the WSD-F20 is a smartwatch with Android Wear 2.0. Thanks to this technology and advanced GPS functionality, this watch will allow you to get the most out of your active lifestyle. 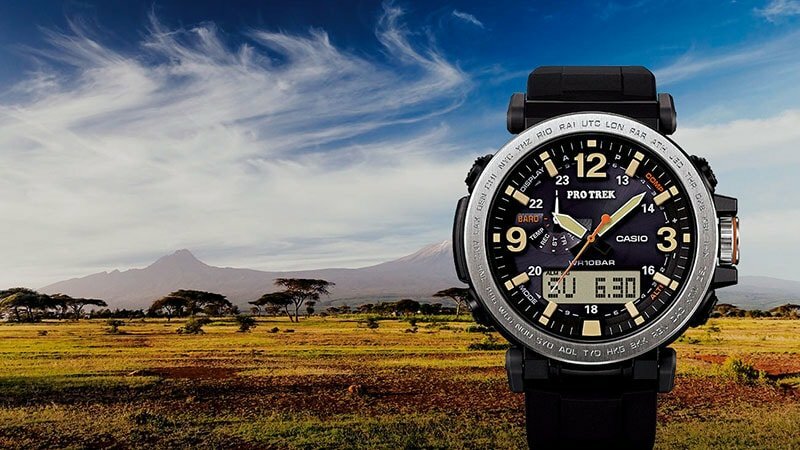 From its full-colour map display and location memory to its built-in sensors for altitudes, atmospheric pressure and directions, this watch has almost everything a modern hiker could need. 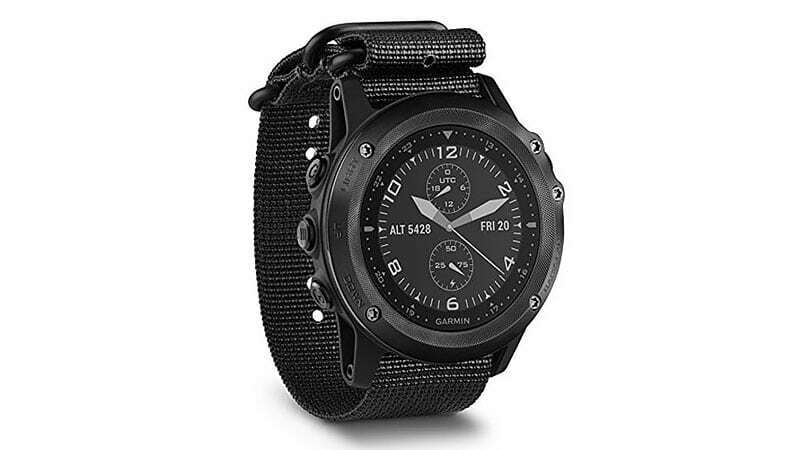 The Garmin Tactix Bravo can handle just about anything you can throw at it. 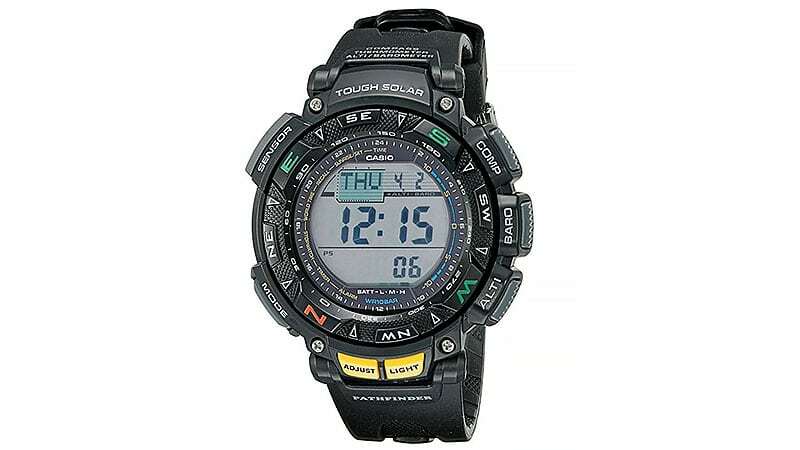 This sturdy timepiece features a durable yet stylish design as well as several excellent features. 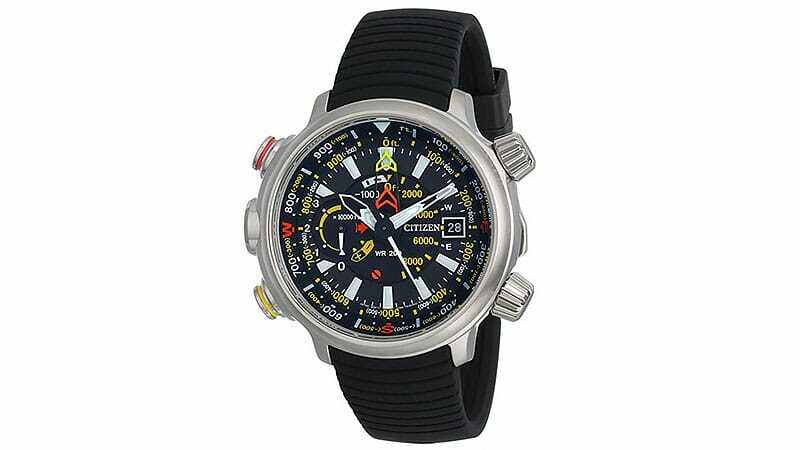 Along with high-sensitivity GPS positioning, the watch includes an altimeter, barometer and three-axis compass. It’s also water-resistant to a level suitable for swimming and compatible for use with night vision goggles. So, whether you’re trail running, swimming or hiking at night, the Tactix Bravo is an ideal companion to carry on your wrist. The Citizen Altichron is a top timepiece for adventure-seekers. The watch features Eco-Drive technology, which means that it runs on light instead of a battery. It also includes an altimeter measuring from -1000 to 32,000 feet and an electronic compass. Additionally, the Altichron’s light-weight titanium design is practical and stylish and features a fashionable black dial with orange accents. The timepiece’s black polyurethane strap also ensures constant comfort and durability for its wearer. You can plan the perfect hiking trip with the Suunto Traverse. From accessing available daylight hours with sunrise and sunset times to uploading new routes to explore, this outdoor activity watch will help you create a safe and sensational plan. With the aid of GPS and tracking details for speed, distance and altitude, you’ll be able to follow your entire progress and path. There’s no need to worry about the weather either. With a watch that can predict weather trends and alert you to storms, you’ll have plenty of time to find shelter or turn around should you need. 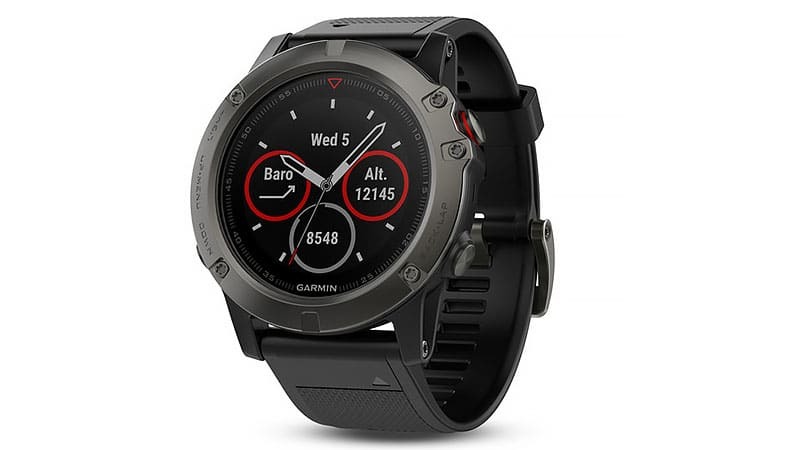 Combining peak performance with exceptional fitness and outdoor functionality, the Garmin Fenix 5X is the ultimate training companion for adventurers. The multi-sport GPS watch features full-colour map guidance as well LED backlighting for excellent readability in all ambient conditions. On top of that, the Fenix 5X boasts additional navigation functions, such as a three-axis compass, gyroscope and barometric altimeter. Its rugged yet elegant design also makes this watch a winning timepiece that you won’t want to take off. 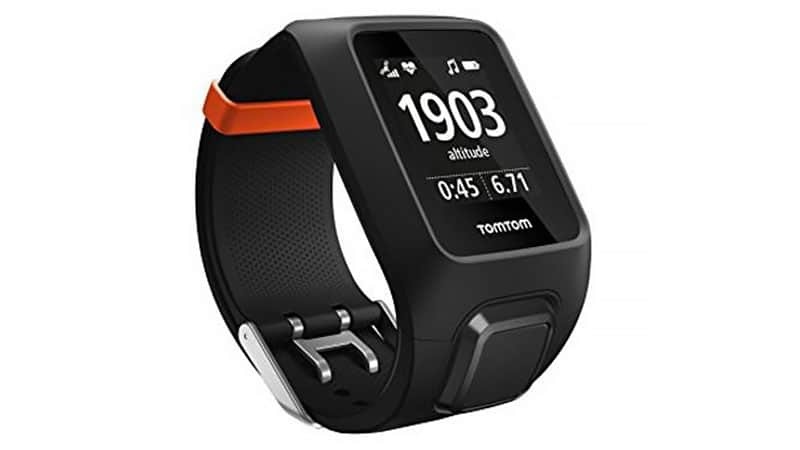 Although the TomTom Adventurer GPS Multisport Watch is suitable for a broad range of activities, it is especially ideal for outdoor adventure sports. So, whether you like to trail-run, hike, ski or snowboard, this top timepiece has a function for your favourite fitness-based activity. As well as featuring a GPS, the Adventurer boasts a built-in music player, barometer, altimeter and compass, and can also measure your heart rate. If you’re worried about your watch running out of battery while you’re on the move, Casio’s PAG240 could be just what you need. This multi-function sports watch is equipped with self-charging, solar power and a battery life that can last up to six months. As for its functions, this top timepiece can sense altitude, moisture levels in the air, the temperature, and features a compass. It also boasts five alarms, a stopwatch, countdown timer, and a full backlight with afterglow for anyone who enjoys hiking at night. 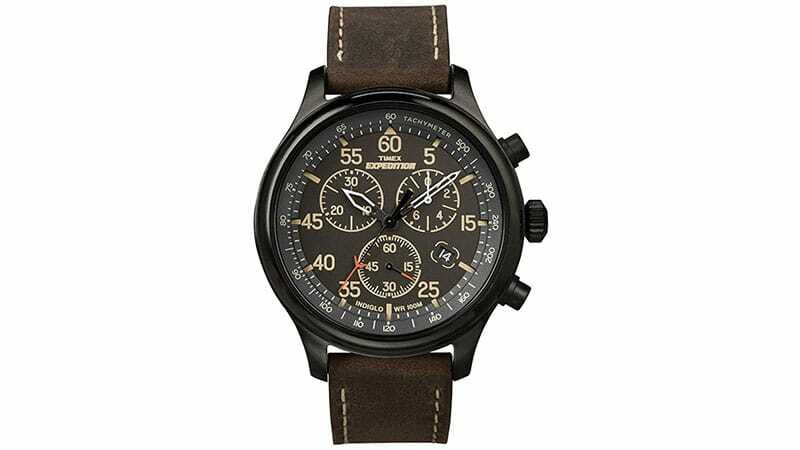 Featuring a classic outdoor design and genuine leather strap, the Timex Men’s Expedition Field Chronograph Watch is equal parts rugged and sophisticated. Created to withstand the toughest hiking trails while also suiting stylish wardrobes, this watch can easily be worn every day. Along with appearing sleek, this timepiece is also highly functional. It features a chronograph, which measures up to 30 minutes, an indigo light-up dial, and is water-resistant to 100m. It also boasts a quartz movement for precision time-keeping.